‘Alchemy: The Lustre of Hill End’ is an immersive, atmospheric and bespoke interpretive installation located in an adaptively reused fire station. The exhibition is an introductory experience for visitors to Hill End. The exhibition showcases the history and significance of Hill End through a thematic interpretive experience designed to connect with visitors. Surrounded by rugged gorges and mountains, Hill End Historic Site (Hill End) is located in the central west region of NSW in the Northern Tablelands. Despite its industrial history as a gold mining village, today Hill End is characterised by its charm and beauty. Its significance is recognised through statutory and non-statutory heritage listings. The development of ‘Alchemy: The Lustre of Hill End’, located within the Hill End Heritage Centre, is part of a broader revitalisation program being implemented by NPWS. Interpretation within the Hill End Heritage Centre conveys the significant heritage values of Hill End through creative, innovative interpretation and an enhanced visitor experience. Our multidisciplinary team planned, developed and implemented the interpretive exhibition, responding to the masterplan and interpretation plan. The process included a critical review and reading of the background documentation, and additional research relating to the historic character, significance, visitors, policies and plans. Community consultation and engagement in the interpretation planning and development of the exhibition content was paramount, as much knowledge, cultural material and information was held in the hearts and minds of local people. Research and review of the various collections was also required to identify objects capable of carrying the themes and stories identified for interpretation. Best practice heritage guidelines and standards informed the planning, design and implementation of the interpretive exhibition. Impacts to the historic fabric were mitigated through design solutions that did not impact on significant fabric. We designed an atmospheric interpretive installation through thoughtful display design and alluring illumination, reflecting the themes of the interpretive experience. 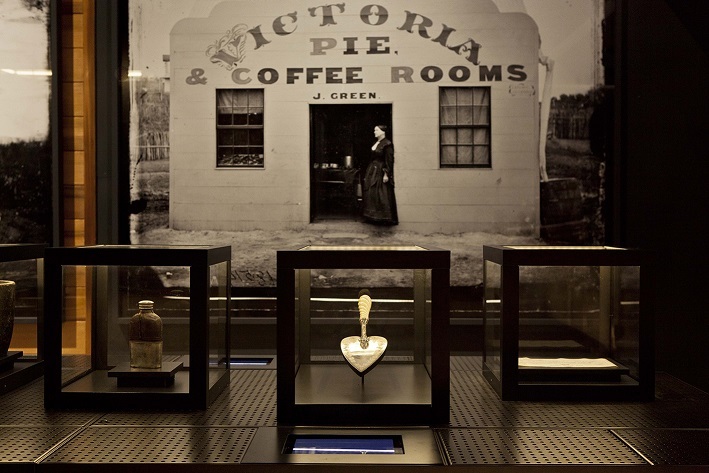 Objects appear as treasures inside self-illuminated framed transparent ‘strong boxes’—an appropriate design reference for a town built on the profits of gold. The ‘outlined cube’ motif is a consistent design vocabulary throughout the installation and informs the design of table legs, seating and housing for touch screens. a large-scale film projection that introduces the themes and stories of the town and incorporates historic images, film and sound. Following on from this room is the ‘story space’, which hosts a playful collection of objects that are talismans to deeper stories delivered through AV, text and image, as part of interactive iPads embedded in a central steel table. The table’s perforated surface allows visual permeability across a small room. The same design thinking was applied to incorporate or repurpose existing architectural heritage features to facilitate the delivery of interpretation. For example, the skeletal heritage cottage remnant at the heart of the building became the centrepiece for an introductory projection and object display piece. Trigger, GML Heritage and NPWS developed interpretive themes and curation in close collaboration. Design and content have been fundamentally entwined during the project and the result is a uniquely integrated content/design experience. Research involved historical investigation using primary and secondary sources, review of archaeological and movable heritage collections, liaison with local historians and collectors, discussions and interviews with local artists and community members. Essentially, the exhibition content was developed and compiled with support and input from local people and those with strong attachments to the place. Conservation Management and Cultural Tourism Master Plan for Hill End Historic Site, March 2014, and the following plans: Conservation Management Plan; Landscape Management Plan; and Cultural Tourism and Recreational Management Plan. The concept, form and themes of the exhibition were informed by the Hill End Interpretation and Revitalisation Plan, authored by GML Heritage and Trigger. Comprehensive exhibition construction, multimedia design and filmic storyboard documentation was created to deliver this project. One of the driving aims of the project was not only to interpret but to revitalise. Central to the curation and design was the onus to create a world-class interpretive experience that contributes to the reinvigoration of the town, not only for visitors but also for locals. The design is a contemporary intervention sleeved into an adaptively reused heritage envelope that seamlessly fits and belongs. Inexpensive and utilitarian materials reflect the pioneering histories of the exhibition, however, the exhibition design avoids rustic heritage design clichés. While the installation is sympathetic to its heritage environment, it is also relevant and engaging for contemporary visitors. Our vision was that Hill End’s story is still unfolding. It is not a story confined to the past and is therefore not static. The thematic curatorial approach to the exhibition was developed to allow refreshes of objects and stories over time as new objects and content comes to light. The design response is a reconfigurable exhibition system involving tables and cabinets, providing opportunities to display a wide variety of different objects and allows ‘information portal’ touch screens to be updated and repositioned to address the needs of new content. As part of the exhibition design an innovative donation concept was developed for the entrance. Each donation triggers a video to play. In default mode the video screens provide dynamic signage and information. The exhibition is designed to stimulate visitors to explore other attractions within and surrounding the township. It functions as a hub—a hive of activity from which other experiences fan out. NSW National Parks and Wildlife Service coordinated and managed the team of consultants through all stages of the project. Investigation, physical analysis, historical research, analysis, collection research and object selection, community consultation and collaboration to develop interpretive content. Design development and documentation for exhibition interpretives, selection of Aboriginal and non-Aboriginal objects, and multimedia development and installation. Best practice standards in heritage management and conservation were maintained throughout the project from planning to delivery. Planning the works and interpretation included adherence to statutory requirements and Office of Environment and Heritage policy. Several groups were engaged through consultation during the planning phase, where their knowledge and experience informed the programming, curation, content and design, in order to create a truly immersive and rich cultural experience with meaning and relevance today. The Interpretation Plan (GML Heritage and Trigger), which informs the exhibition’s thematic and design structure, was developed by our team in close consultation with the client and community. a report was developed by the NPWS in response to the submissions received about the plan. The project contributes to the broader knowledge and evolution of heritage practice through place-based interpretation that engages with contemporary social values and history-making as a continuing practice. In November and December 1957, fires raged in the region. Despite requests for aid, none arrived, and local volunteers were left to fight the fires themselves. A year later, the community held the Hill End Bushfire Festival to raise funds for desperately needed fire-fighting equipment. The Hill End Fire Brigade purchased this fire engine, known as the Blitz, with the profits. In 2004, the brigade and local police retrieved the disused engine from a paddock north of Hill End. In 2013, it was relocated to the Rural Fire Service shed and restored to its former glory by community volunteers. Various objects and features have been conserved for the exhibition, including the freshly conserved Blitz which enjoys a prominent place in the exhibition. Other features include the archaeological evidence associated with the former well and the remains of the historic cottage that were found within the shed and various objects within the NPWS’ collection of movable heritage. This project is a step towards shaping the future of interpretation in heritage spaces and shows how place based research and community engagement over a considerable period of time and design are crucial ingredients in achieving this objective. The response to the exhibition has been overwhelmingly positive across a spectrum of visitors—international, national and local. The donation interactive has been successful in raising funds and this demonstrates that the interpretive experience has been well received. Designing an exhibition for a relatively remote location is always a logistical challenge. Fortunately, the Hill End NPWS staff has a vast range of planning and technical skills to support this ambitious and original venture. Most importantly they understand how innovative interpretation contributes to the town. This project purposefully combines sensitivity to a fragile and significant heritage place with new spatial, physical and digital elements, giving life to and creating a multisensory experience for the visitor. The exhibition has contributed to the revitalisation of the former Rural Fire Station shed interior, and has provided a renewed thematic interpretive experience created to enhance public appreciation, enjoyment and understanding of the place’s extraordinary heritage values. NSW National Parks and Wildlife Service (NPWS) (Client) Trigger (Interpretive Design and Planning) GML Heritage (Content Development) Subconsultants: D’Luscious (Film) Brian Shirley (Projection) Macadamia (Multimedia) State Library of NSW (Multimedia).